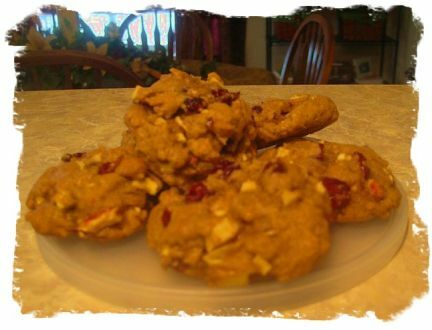 Yummy Apple Craisin Cookie Recipe! SIFT flour, baking soda, cinnamon, cloves, nutmeg, salt. then in another bowl, cream together the butter, sugar, egg. put into flour mixture while adding in nuts, apples, raisins. use smallest scooper and then bake for 12-15 min. when cool add optional glaze. Looks like the cloves and an egg may be the only thing I have in stock at home - guess I'll have to go shopping. but they do look and sound delicious. How do you only have that in your house? I'd starve ...then again, maybe you guys eat every few hours like I do. I'm always re-stocking. Kind of obsessive compulsive about having 2 or more of everything I use regularly. Kind of obsessive compulsive about having 2 or more of everything I use regularly. I have two refrigerators and a pantry and still have no room. We're definitely getting another freezer at the next house, but I've got shelves and shelves of food in our garage (remember, we don't have to worry about bugs or anything here and in the summer ..it doesn't get hot enough to spoil anything). We have a lot more food than our Mormon friends (who have to keep a year's supply of food handy at their house). I get this obsession to "never ever run out of anything" from my mom. our Mormon friends (who have to keep a year's supply of food handy at their house). It's something they believe and are advised to do (mostly freeze dried, canned, water, jarred stuff like homemade sauces&jams, etc). From what I know, it's for the most part in case of an emergency. They can be self efficient and provide for their family, as commanded to in the Bible ...whether it be from natural disasters which they believe will come or someone was fired, money problems or anything unpredictable like that.